Re-letting a property is a key time in the lifecycle of a buy-to-let and now that Spring is arriving we are in a popular time for tenants to give their notice. When that happens, we want to make the transition of tenants as quick and straightforward as possible, whilst still being thorough and getting the fullest available rental value for the property. 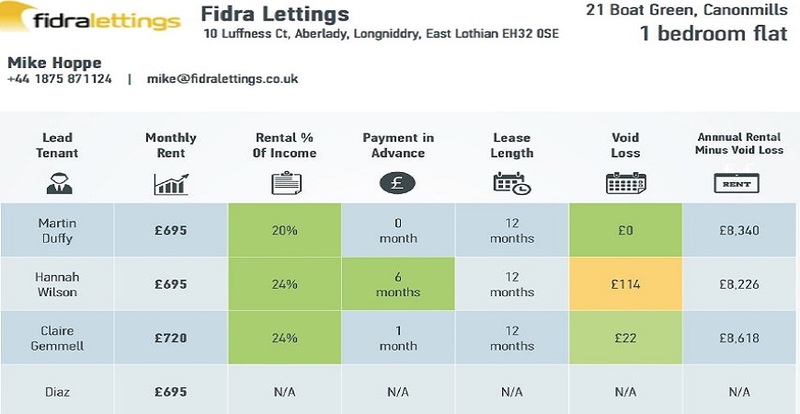 That’s why we have become the first letting agent in Scotland to use an exciting new software called Applyproperty.com. This system allows potential tenants select a property from our website and apply for it online. Once they begin the application they have 48 hours to complete. Not only can tenants apply online, they can also see if others have applied and offer to pay higher rents in order to outbid other applicants to help their chances of securing the property. For landlords that means you can be sure the rental value you get is the best available. Not only can they up bids on rentals, they can also offer months of advance rental payments to strengthen the case for their application. Of course, we still take detailed references and require credit checks to complete the application process in full. However, all of that information is now collated by Applyproperty.com into one report to provide landlords a detailed insight into how we are making our decisions to approve or deny applicants for tenancies. This new software is already active in our business and it is streamlining the way we let properties. It is now easier than ever for a tenant to begin an application, with the whole process now immediately accessible to them through our website. When reviewing the applications we now have a fuller picture than ever before of who the applicants are and what kind of tenants they might be. That means you can have even greater confidence that you are getting the absolute best out of your buy-to-let investment.